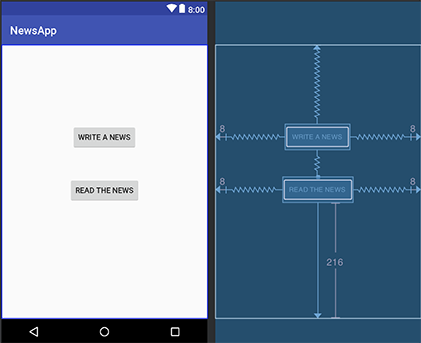 In this post, we'll go through how to create a simple app on Android Studio using Kotlin and Matchmore. The app we'll create is a location-based news app. It will enable news or information to be sent out to people within a defined range of distance. As a reminder, Matchmore introduced the notion of Geomatching which is implemented as an extension of the publish–subscribe messaging pattern. Matchmore extend the publish-subscribe messaging pattern with the ability to filter information not only based on content but also on context: each publication (subscription) is valid for a given duration and within a certain geospatial area, which moves with the publication (subscription) if the corresponding device moves. When a matching publication and subscription have their areas overlaping, a match occurs and the subscriber receives the information. We are going to use the geomatching functionality of Matchmore to create a simple app that can be used to share news within a defined range. This simple and quite useful app can be used to advert a promotion or to spread news in a school campus. The first part will explain how to build your UI and how to set up your development environment. The second part will focus on how to use Matchmore for a location-based news app. Good knowledge of Kotlin. If you are used to Java, you can find some good tutorials on how to switch from Java to Kotlin here. If you want to test the app in real life, you'll need at least two Android Phones running on Android 4.4+. Else, you can test it via the Android Emulator. Willingness to learn some new stuff. 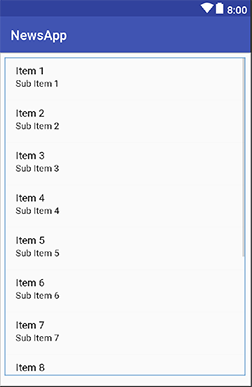 This blog post is based on the previous tutorial Create an Android app with Matchmore. The previous tutorial contains more details such as how to set up your tools and get the API key. If you feel that this tutorial is too difficult, we advise you to start with the previous one. The first one will be the Main Activity with a simple layout that will have only 2 buttons linked to the 2 other activities. The second one will be for the user who wants to advert news. We will make it simple, by adding two text fields and one submit button to the layout. The first text field will set the news title and the second one the news content. The third activity will be for the news subscribers and it will display all the news based on the matches gotten by the user. Create a new project (let's call it NewsApp) with an empty activity. Don't forget to check the box related to adding Kotlin Support. The main activity will be the landing point of our app. As we want it to be simple, we are only going to add two buttons on the layout. Now let's move to the WriteActivity. This activity will be used to publish news or information. 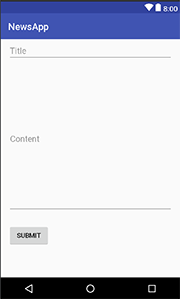 To make the layout as simple as possible, we are just going to add two text fields, a submit button and one TextView. As we said before, one text field will be created for the title and the second one for the news content. The TextView will be used to provide the status of our actions. The WriteActivity will be used by our app to create a location-based publication. In this example, we will set manually the range and the expiry date. However, it's possible to customize the range and expiry date in your app. The next activity will mostly be used by the subscribers of our app. The main goal of this activity will be to print out the list of all the matches. When the susbcriber enters into a news post range, there will be an instant match. All the matches will be displayed through this activity. Now, we have a minimalist user interface for our application, the next step is to link the UI to the code. val "val_name" = findViewById("UI Element") as "UI element's type"
We need to create a new val that will get the data entered by the user in the two textfields. In the second part of this blog post, we will create a publication when the user clicks on the submit button. In the ReadActivity we will do the same thing for the ListView. This list will be used to print all the matches that we are going to receive. In this second part of the blog post, we are going to integrate Matchmore to our minimalist app. In case you have missed the first part, you can download the code of the app on this link. As a reminder, the goal of our app is to share news within a specific range and with an expiry date. The solution behind this location-based news app could also be used for geofencing marketing. The app would trigger a notification when a potential customer enters a shop, or the area close to the shop, where there is a special discount on a product for example. As you will see in the second part of this blog post, we will build our application easily using Matchmore. Here we go! First of all, we have to create an account on Matchmore, sign up for free here. Then we will create a new app and get the API key. See how to get the API key at Matchmore here. Take time to read the article of Adam Smolarek about the permission in your app, on this link. Since Matchmore is built around the publish-subscribe pattern, we must create a new publication in order to share the news. A publication can be seen as a Java Messaging Service (JMS) publication extended with the notion of geographical zone. This zone is defined by a (center) location and a range around that location. The topic of our news (e.g: Campus Info, discount, etc.). The range of our publication (in meters). The duration: By default, we will do a publication that will last for 1 800 seconds (30 minutes). The properties: We can use the properties to pass information between devices when a match occurs. For our case, the properties will be used to send the title and the content of our news. A publication will be created when the user clicks on the submit button. When the publication is made, we will update the status and inform the user that the publication has been made successful. This will create a publication with a range of 500 meters around the user's device and the publication will expire after 180 seconds. The subscription will be created with the same principles. Each subscription need to have at least a topic, a range and a duration. When a subscriber enters inside a publication's range, if they have the same topic, a match will occurs. Since we are going the add a subscription and list the matches in the same activity, we will separate these two parts in our code and create two separate functions: addSub() and checkMatches(). Please make sure to have the same topic as the publication! The purpose of this function is to receive the matches and to extract what we need in the ListView. Set a MatchListener: Just like the clickListener that we set up before, the MatchListener will be triggered every time when there is a match. Browse the matches: As a Set Collection are unordered, matches will collect all the matches and put them into a collection. We will use the .first method to get the most recent match. Populate: Since we have the most recent match, we can add the information that we need into the ArrayList rsl that we have created by adding a new row. startPollingMatches(1000) is used to interrogate Matchmore regularly depending on the refreshing time that we sets up. The argument of startPollingMatches is set in milliseconds. I hope you enjoyed this blog post! Don't hesitate to take a look at the code of this app on Github. If you have any questions, feel free to contact me by email or on Gitter. Do you need some inspiration of what kind of location-based services you can do with Matchmore? If yes, read this blog post! We present 5 different location-based app ideas which you can easily build with Matchmore. Let the inspiration flow! This is our step by step walk through for the solution we presented for Deutsche Bahn earlier this year, as part of the Comfort Check-in Challenge. The solution includes an app, QR codes and of course our context-aware technology. Our solution can be used for passengers as well as for conductors.